After seven months of hard work and concentration, over 300 sporter and precision air rifle juniors are competing this week at the 2014 CMP National Three Position Air Rifle Championship. The event runs June 23 through 28 at the new Gary Anderson CMP Competition Center in Camp Perry, Ohio. Junior marksmen participating in the CMP National Championship will also be competing in the USA Shooting National 3P Junior Olympics. Sporter competitors will fire on Tuesday, June 24, while precision competitors will follow on Friday, June 27. The National Junior Olympics will also be held in the Gary Anderson CMP Competition Center. Big money is at stake for the teams. First place teams in the sporter and precision competitions will receive $10,000 towards their team’s MidwayUSA endowment, while second and third place teams will earn $7,500 and $5,000, respectively. MidwayUSA contributed over $460,000 towards the competition. The event is free and open to the public. The world-class Gary Anderson CMP Competition Center boasts 80 firing points with state-of-the-art electronic targets. Spectators are able to observe each competitor’s shot via large, 90-inch overhead monitors. CLICK HERE for more info on the CMP National Three Position Air Rifle Championship. 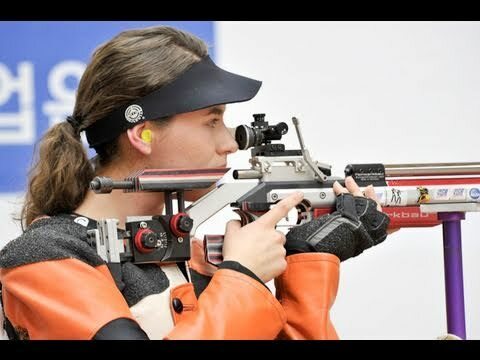 Share the post "300+ Juniors Compete at 3P Air Rifle National Championship"